Some of the BBC’s leading male presenters have agreed to take a pay cut after revelations over equal pay. Jeremy Vine, John Humphrys and Huw Edwards have agreed to reductions, either formally or in principle, the BBC’s media editor Amol Rajan said. It follows Carrie Gracie’s resignation from her post as BBC China editor in protest at unequal pay between male and female international editors. 5 live presenter Nicky Campbell told listeners he had also taken a cut. And North America editor Jon Sopel is believed to be in discussions with the corporation. On his way into work at Radio 2 on Friday, Jeremy Vine was asked by reporters why he had agreed to a lower wage. “I think it needs to be sorted out and I support my female colleagues who have rightly said they should be paid the same when they’re doing the same job,” he said. 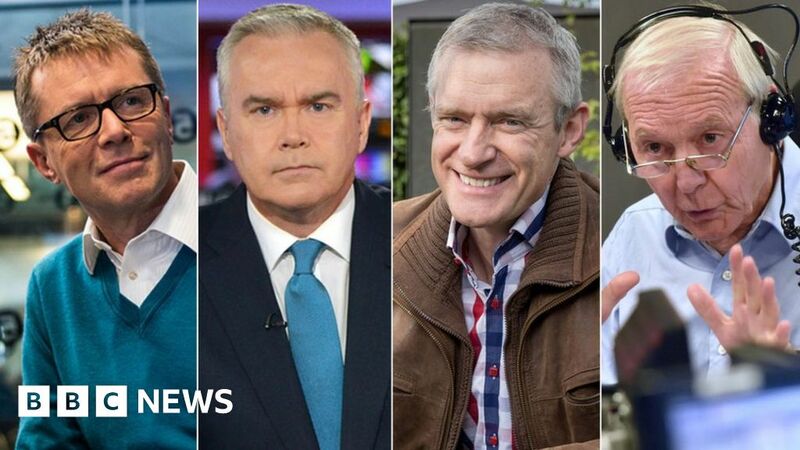 The BBC revealed the pay of on-air talent earning over £150,000 in July, with two-thirds of stars on the list being men. Nicky Campbell confirmed on BBC 5 live’s Breakfast show on Friday that he had taken a pay cut. An independent audit into equal pay at the BBC will be published next week. Chris Evans topped the list of the best-paid BBC presenters that was published last summer, earning between £2.2m and £2.25m in 2016/2017. The highest-paid woman, Claudia Winkleman, earned significantly less – between £450,000 and £500,000. After leaving her post as China editor, Gracie is now returning to the BBC newsroom in London, saying she expects to be “paid equally”. Amol Rajan said while competition in the entertainment industry had intensified, the opposite has happened in news. “Many of those now taking pay cuts secured generous deals years ago,” he said. Gracie is due to appear before a select committee of MPs next week, shortly before the director general of the BBC, Tony Hall, his deputy, Anne Bulford and the director of news and current affairs, Fran Unsworth. They were called to discuss what action the corporation is taking to address the gender pay gap. Lord Hall pledged to close the gap by 2020, saying the corporation should be “an exemplar of what can be achieved when it comes to pay, fairness, gender and representation”.